Vishal is one actor / producer who fixes the release date of his films well in advance and has also been unfailing to release his films on the said dates. It all started with Pandiya Nadu; and in spite of a big release like Arrambam, he released his film and it indeed turned out to be fruitful for him. Likewise his films Naan Sigappu Manithan, Poojai and Aambala were all released exactly on the planned dates, which again is actually a significant feature given the industry’s scenario where nothing is certain until the moment the film hits the screens. Vishal has yet again announced the release date, in a recent press meet, of his upcoming movie, Paayum Puli where he teams up with Suseenthiran again. 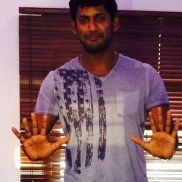 Vishal says that the film will release on the 17th of September for Ganesh Chaturthi. Apparently 25 days of shoot for Paayum Puli has been canned so far in the outskirts of Chennai at places like Avadi. Talkies and fight scenes choreographed by 'Anl' Arasu have been shot and the team is likely to leave abroad for song shoots from the month of June. Vishal Is A Cop, But Not As Expected..
People looking for online information on Paayum Puli, Suseenthiran, Vishal will find this news story useful.